Your kids are taking forever to eat their breakfast, brush their teeth, and put on their socks. You have five minutes to get them into the car before you’ll be officially late for school, dance class, day care, or grandma’s house. No matter what time you get up in the morning, getting them dressed, fed, and into the car with all their stuff takes so much time, you’re always late. And longing for the days before kids when you could simply go to the car with only your keys and leave the house without making sure everyone remembered to put on pants. Mornings with kids are chaotic. Here are 10 tips for getting out of the house more efficiently with less headaches. 1. Do everything that you can the night before. While cleaning up from dinner or bedtime snack, prepare lunches, pour drinks into sippy cups and refrigerate, organize your coat station, and put folders into backpacks. Have the children help get their lunches and backpacks ready as part of age-appropriate chores. 2. Take yourself out of the equation. Shower at night or get up earlier than the kids. 3. Get the kids’ stuff organized. Keep all shoes, coats, backpacks, and weather-appropriate accessories in one place. Teach your children to return their shoes and coats to this place upon coming home. 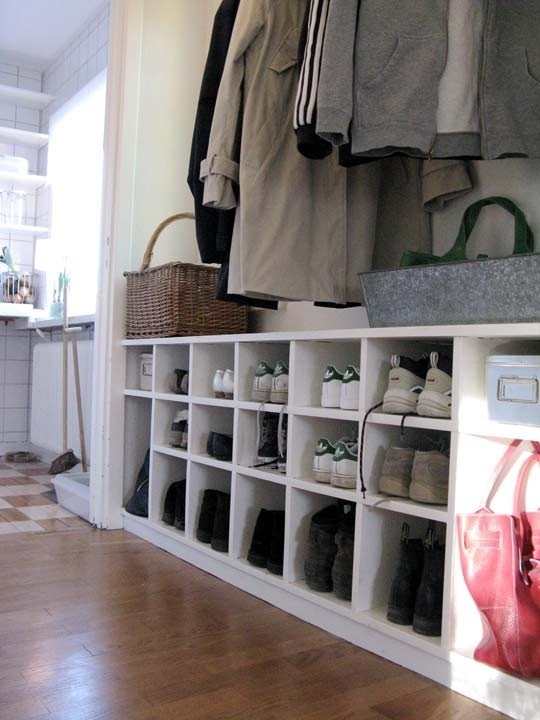 Usually this organizer resides by the exit to the car and can take the form of built-in cubbies, or simply coat hooks, a bench, and baskets underneath. 4. Get them dressed before breakfast in their rooms. Once we are downstairs, we stay downstairs as a team. Try to avoid running up and down the stairs all morning. 5. Give them lots of time to put on shoes and coats. In the meantime, you can finish your cereal, throw plates into the kitchen sink, and brush your own teeth. Teach your children how to put on shoes and how to zip up coats. 6. Keep a set of toothbrushes in the downstairs powder room, including your own. Buy a second set to accommodate both and upstairs and downstairs bathrooms if necessary. That way, no one has to traipse back upstairs for after-breakfast brushing. 7. Make breakfast portable to accommodate that slow eater. There seems to be at least one per family. I recently switched our breakfast from cereal to toast, PopTarts, waffles, pancakes, French toast, bananas, and go-gurts to make any transition into the car. 8. Ban screen time. I don’t judge others on screen time, because I rely on it myself, but severely limit or don’t use screen time at all in the morning. I don’t want to be late leaving the house because we have to finish the last two minutes of some episode of Disney Junior. Switch the screen time to the afternoon, when everyone’s tired. 9. Give plenty of warnings as to leaving time. Our stimulating conversation over breakfast usually involves me telling them how many minutes they have left to hurry up and eat. 10. Ban stuffed animals from the car. Alternatively, designate “house toys” and “car toys” and keep them where they belong to avoid the dash-in for a forgotten favorite toy.